Of those who collect books, some might have copies of the 12 novels written by Patrick White. Or the 50 novels written by the elder statesman of Australian storytelling, Jon Cleary. Or the full works of fiction and non-fiction titles—the number is around 60—written by Sydney’s Peter Corris. Few collectors, however, could hope to match Stewart Russell’s collection of books by the late English writer John Creasey, who died in 1974. Russell, an unlikely expert on Creasey’s extraordinary output, estimates that Creasey wrote almost 800 books. Russell’s collection of books by Creasey adds up to more than 1000, including several editions of the one title, or several editions of the one title in different languages. Creasey’s eventful life included founding his own political party, the All Party Alliance, for which he fought five parliamentary elections. Aside from writing and politics, he took an 18-month trip around the world in his Rolls-Royce, which he recorded on film. 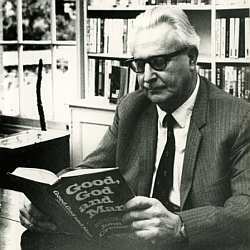 Creasey was married four times, smoked up to 100 cigarettes a day, founded the British Crime Writers Association, and pioneered the philosophy he described as “selfism”, as detailed in his book Good, God and Man. In his main genre of writing, crime, he was among the first to write what is known as 'police procedurals'. After first being published in 1930, aged 22, he wrote under 26 pseudonyms as well as his own name. By the time of his death, aged 64, his books had sold 100 million copies in 28 languages. Russell knew nothing of all this when he chanced across a Creasey book on holiday in his native Scotland. After Christmas 1993, Russell and a bunch of artist friends hired a house on Scotland’s Isle of Skye to see in the New Year. In the house was a copy of a book called The Toff on Ice by John Creasey. Russell liked the cover. He began reading. Over the next few days, he was drawn in not so much by the power of the literature, but by its familiarity. Russell always felt he knew where the book was taking him. He believed that anyone who had been educated in a British school would have done so. Russell souvenired the book, which had a list of 50 Creasey titles inside the jacket. During a subsequent weekend, he chanced across a Creasey title in a second-hand bookshop in Edinburgh. This book also had a list of 50 Creasey titles inside the jacket. Russell checked the titles listed in both books and found that only two were the same. That meant that one writer had 98 books. Russell wondered whether he was on to more of a "cultural inheritance" than he first thought. After alerting friends to his discovery, Russell had several on the lookout for books by Creasey. 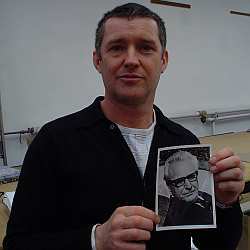 He himself sought out Creasey’s son Richard, a television producer in London, who was very helpful. He went to a museum in the Salisbury, County Wiltshire, Creasey’s home town, which has a library named in honour of Creasey. The library put Russell on to one of Creasey’s friends, Julian Symons, who was also a crime writer, and quite a renowned one. Symons’s advice was to overlook the “Toff” titles and go for those that featured the character “Gideon”. 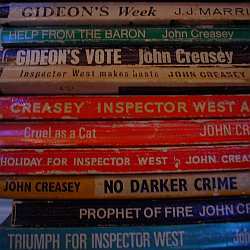 Symons told Russell that Creasey had written more than 500 books. He was more than ready to admit that such fecundity had diminished quality, and that Creasey had written to well-worn formulae. “He was laughing, too,” Russell said. Creasey’s fourth wife, Diana Farrell, was curious as to why anyone would bother with her late husband’s books. She told him she had not met anybody who was interested in them, not even his friends. He used his collection as the basis for works in fine-art exhibitions in London. Sometimes he arranged the books according to jacket colour. Other times they were arranged according to the year in which they were written. On one occasion he exhibited more than 200 books that had the word “death” in the title. In 1997, by which time filmmakers were interested in Russell’s Creasey quest, he estimated that the late author had written 786 books. Three years later, in 2000, by which time a potential documentary had fallen though, Russell, his wife Donna and daughter Grace emigrated to Australia. (Another daughter, Flora, has since been born.) His collection of Creasey books and paraphernalia was shipped over. Russell remains proud that his Creasey collection provides a substantial “document of the everyday” of life in British in the middle decades of last century. “It’s all about preserving,” he said. Recent articles by Paul Daffey. The Barcelona Football Club has broken with tradition and gone against the corporate grain of modern sport, making a gesture that will boost efforts to improve the lives of many underprivileged children around the world. A crude distinction between "bush life of their ancestors" and "modern youth culture" makes hunting "ancestral", and heavy metal music "modern", as if modern men don't hunt, and those who do cannot enjoy heavy metal music.